The Fringillids, sometimes called the True Finches, are a very large set of specialized seedeaters found around the globe. Most have modified beaks for holding and shelling seeds. 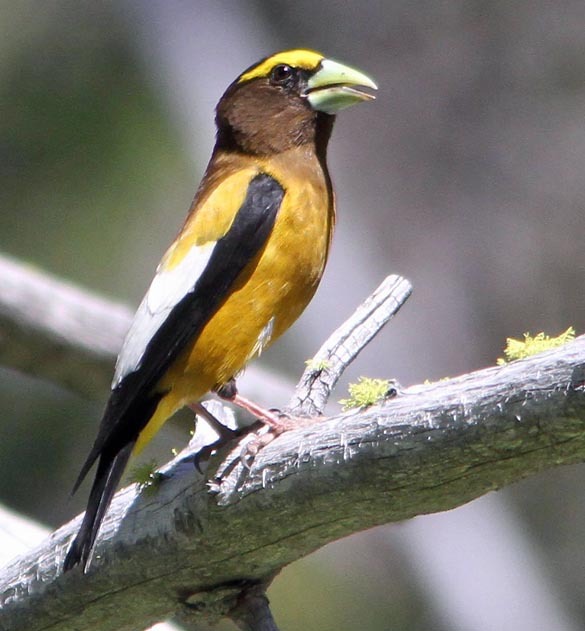 Some have very large bills for dealing with large seeds, such as Evening Grosbeak (left); others have small bills for small seeds. The remainder of this web page provides a very basic overview of the remaining Fringillidae. 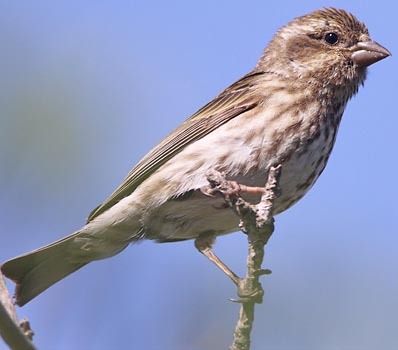 There are many types of birds called "finches." These include Galapagos finches [now considered Tanagers], various estrildids that are called "finches," and a variety of emberizids and related birds. Likewise, some fringillids are termed "grosbeaks" or "seedeaters," but are not closely related to traditional grosbeaks or the widespread Neotropical seedeaters. All "finches," of whatever family, are seed eaters but what sets the Fringillids apart are their special adaptations for dealing with seeds. Fringillids have stout conical bills, strong skulls, large jaw muscles, and powerful gizzards. The seed is wedged in a special groove at the side of the palate and crushed by raising the lower jaw onto it, as the Common Chaffinch (right) is doing. The husk is then peeled off with the aid of the tongue, releasing the kernel which is swallowed. They also have minute outer primaries, entirely concealed by the wing coverts and differ from emberizid finches by having mandible edges that fit closely together throughout the length of the beak. The AOU and other authorities now arrange the Fringillidae into 3 subfamilies. Most basal are the Fringillinae — 3 species of Fringilla in the Holarctic, including the widespread Common Chaffinch. Not only is in found throughout northern Eurasia, it has been introduced to New Zealand, where it is now common (and where this photo was taken). The most recent molecular evidence (e.g., Lerner et al., 2011, Zuccon et al., 2012) suggests that the remaining two subfamilies are sister clades whose ancestors presumably arose in the Old World: the Euphoniinae (now restricted to the New World, more on them below) and the Carduelinae. The Carduelinae has a very large set of species that include the Haemorhous finches of the New World (3 species, represented by a male House Finch, far left) and the similar Carpodacus rosefinches (15 species) in the Old World); Hawaiian Honeycreepers (see separate page); the Serinus canaries and relatives (various seedeaters and serins, 40 species), represented here by Cape Canary (near left); and various goldfinches, bullfinches, greenfinches, siskins, and selected grosbeaks. Fringillids live in a wide variety of habitats. Trumpeter Finch (right) inhabits the bare stony desert of the Middle East, habitat. Black Rosy-Finch (above) prefers the alpine snowfields above treeline in the upper Great Basin of North America. 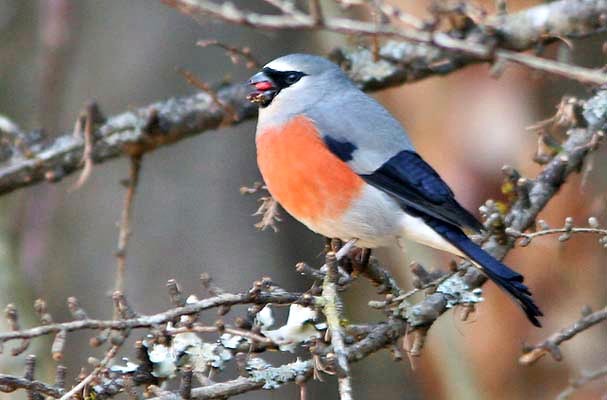 The gorgeous Gray-headed Bullfinch (below) of eastern Asia frequents coniferous and mixed subalpine and alpine forests in the Himalayas to central China. Many cardueline finches exhibit pronounced sexual dimorphism, as does Purple Finch of North America (female, left, is plain and streaky; males rosy-red). Others, such as Streaky Seedeater (right) of east African highlands, is plain and streaky in both sexes. There are some lovely birds among the fringillids, including the three goldfinches of North America, of which Lawrence's Goldfinch of the western U.S. is a prize (female near right, male far right). The female's plumage is subtle but the male is dramatic; both give characteristic high-pitched tinkling calls that, when learned, are the key to finding this nomadic birds. 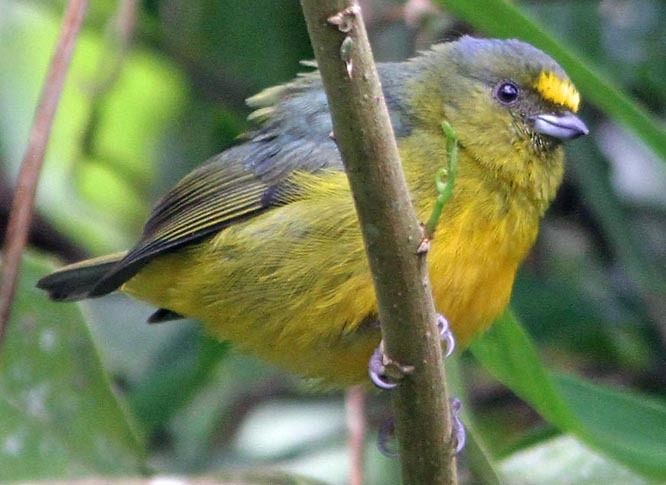 In a surprise, the genetic evidence has shown that genera Euphonia and Chlorophonia, traditionally placed among the Tanagers, are actually fringillids (Zuccon et al. 2012). These are brightly colored Neotropical species, split between about 26 Euphonias and five Chlorophonias. Just two examples are Violaceous Euphonia (a male, above left, in Trinidad) and Chestnut-bellied Euphonia (a male, above right, in southeast Brazil). Euphonias are often found in pairs, often foraging low or mid-canopy, but the more elusive chlorophonias – like this Blue-crowned Chlorophonia in a Mexican montane cloud forest — can be elusive in pairs or small flocks high in the canopy. This entire subfamily [Euphoniinae] is composed of small birds with stubby bills, and which make globular nests with side entrances. A fair number of Euphonias are widespread in Central and/or South America, but there are also some species restricted to narrow ranges. One of these is less colorful Bronze-olive Euphonia (below) which inhabits a narrow elevational range (3200-6500' = 1000-2000m) in humid montane forests on the east slope of the Andes from Colombia to Bolivia. This puts it at a higher elevation than most euphonias, and its coloration is more subtle than many of the brightly-colored euphonias in the lowlands. There are clearly fringillids in the tropics, including the euphonias and chlorophonias, but many birders live with finches at higher latitudes. Many of the northern species of fringillid finches are migratory, moving well south in winter and sometimes (as do the redpolls) in 'invasion' numbers to more southern climes. Among the most complex of these invaders are various "types" of Red Crossbill in North America. At least 10 distinctive call "types" have been identified through the work of Groth (1988, 1993), Benkman (1993) and others. There is a close association of call "types" and primary habitat choices of coniferous trees. 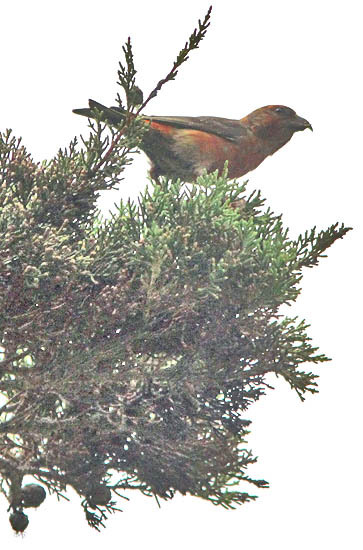 For example, the "type 2" Red Crossbill that is resident in the Sierra Nevada of California (and in many other western forests), and occasional erupts to coastal Monterey County, California, is associated with Ponderosa pines, while the "type 3" crossbill generally breeds much farther north and is associated with Western Hemlock conifers. On-line resources include Jeff Groth's old page on the AMNH website; Craig Benkman's paper in Colorado Birds; a fine introduction in Nathan Pieplow's ear-birding blog; and an eBird primer with sonograms and flight calls to hear. 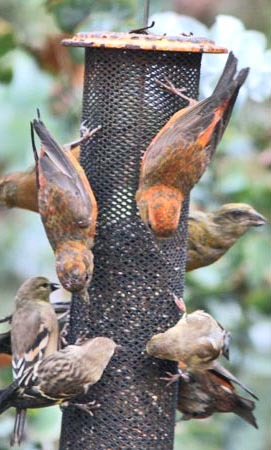 It is possible that the ten "types" of Red Crossbills represent ten species. It was that ability to listen and learned calls that helped us identify an early fall "invasion" of Red Crossbills in coastal California in Sep 2012. In my notes I wrote that the crossbills gave "a fast, twittering and slightly wirey 'tchp-tchp-tchp-tchp-tchp' set of calls, which to my ar sound fast, softer, perhaps slight higher-pitched, and with a wirey overtone, compared to the more distinct, louder, slower, standard 'kip-kip-kip" of our 'normal' type 2 crossbills." Recording made and reviewed by crossbill researchers confirmed that we were witnessing an extraordinary invasion of the northern "type 3" Red Crossbill (left, male on a Monterey pine). So we watch our feeders for "winter finches," just as do thousands, maybe millions, of American birders. 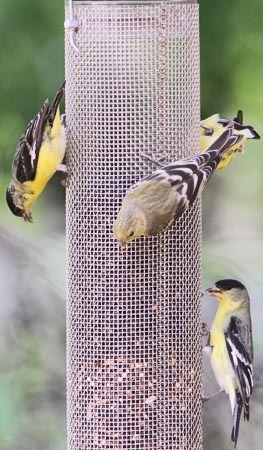 The thistle and sunflower seed-feeder gets a workout in summer from American Goldfinch (far left, below); replaced sometimes in fall by Lesser Goldfinch (center left, below); accompanied in some winters by many Pine Siskin (center right, below); and then the occasional rarity -- here (far right, below) a small flock of "type 3" Red Crossbill during their single appearance at the feeder in Sep 2012. Photos: The male Evening Grosbeak Coccothraustes vespertinus was near Basset's, Sierra Co., CA, on 19 June 2014. 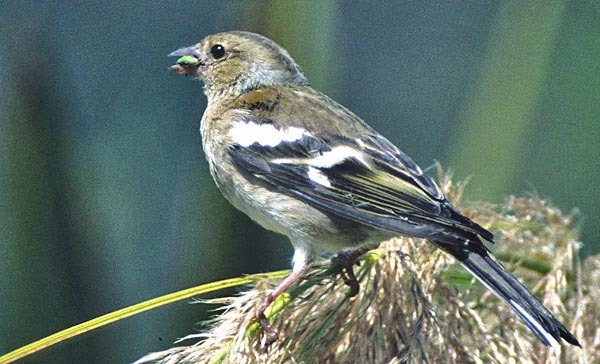 The female Chaffinch Fringilla coelebs was taken in Dec 1997 on North Island, New Zealand — where Chaffinch is an introduced species from Europe. 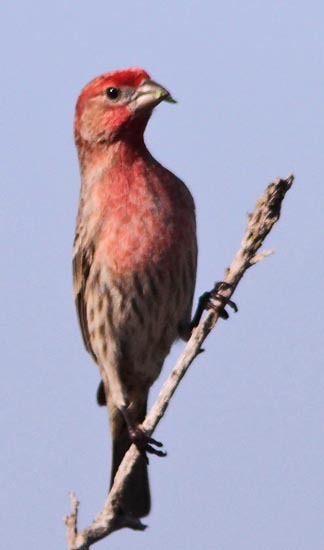 The House Finch Haemorhous mexicanus was carrying food on 19 Mar 2015 in Pebble Beach, CA. 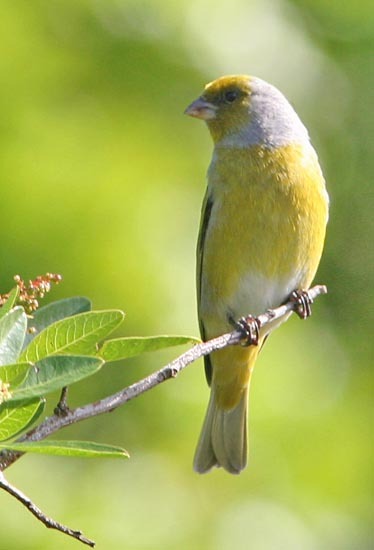 The Cape Canary Serinus canicollis was at Simontown, Cape Town, South Africa, in July 2005. The Black Rosy-Finch Leucosticte atrata was frequenting remnants of snow patches in Grand Staircase-Escalate Nat'l Monument, Utah, on 18 Mar 2008. 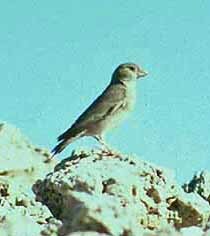 The Trumpeter Finch Rhodopechys githaginea was at Sham-el-sheik, Sinai, Egypt, on 7 Nov 1981. The male Gray-headed Bullfinch Pyrrhula erythaca was at Changqing Reserve, China, on 8 Nov 2010. The female Purple Finch Haemorhous purpureus was at the Salinas River mouth, Monterey Co., CA on 31 May 2014. 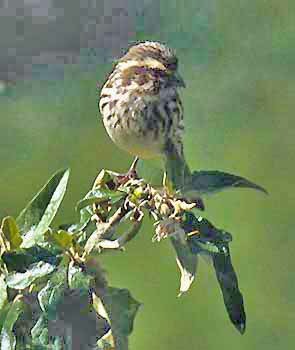 The Streaky Seedeater Serinus striolatus was at Mountain Lodge on Mt. Kenya, Kenya, in Nov 1981. The female Lawrence's Goldfinch Spinus lawrencei was at Parkfield, CA, on 8 July 2015; the male was at Gonzales, CA, on 15 Mar 2014. 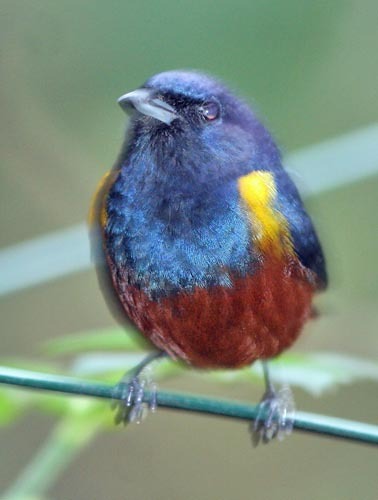 The Violaceous Euphonia Euphonia violacea was at Asa Wright Reserve, Trinidad, in Dec 2006. The Chestnut-bellied Euphonia Euphonia pectoralis was at Itatiaia Reserve, Brazil, on 3 Aug 2010. 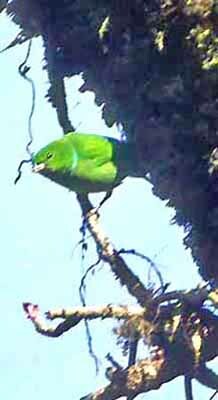 The limb-creeping Blue-crowned Chlorophonia Chlorophonia occipitalis was above Canyon Hondo on the trail to El Triunfo, Chiapas, Mexico, in April 1986. The male Bronze-green Euphonia Euphonia mesochrysa was at Flor de Cafe, Peru, on 16 Nov 2014. The male "type 3" Red Crossbill Loxia curvirostra was in El Carmelo Cemetery, Pacific Grove, CA, on 15 Sep 2012. 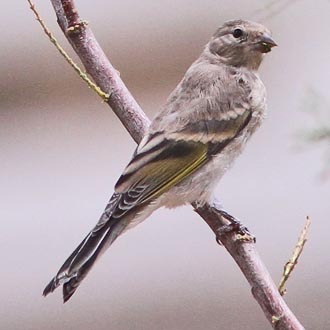 The American Goldfinch Spinus tristis were at my feeder on 1 June 2008, the Lesser Goldfinch Spinus psaltria were actually in Patagonia, Arizona (on a similar-type feeder) on 2 May 2015 (the AZ location explains the black back of the left-hand bird), the Pine Siskin Spinus pinus was at Pacific Grove on 29 July 2012, and the "type 3" Red Crossbill were there 30 Sep 2012. All photos © Don Roberson; all rights reserved. Clement, P., A. Harris, and J. Davis. 1993. Finches and Sparrows: An Identification Guide. Princeton Univ. Press, Princeton, N. J. This is a rather thick contribution to the bird families of the world literature, nicely done by Princeton Univ. Press and better than the "average" recent publication in various other series. The Princeton Press books generally fall short of the excellent quality of the Oxford series, in my view. Both of these series use "field guide" style poses for the artwork, but the Oxford series excels in behavioral information and in having the leading experts on a family author the books. This one, however, a solid contribution that covers not only the Fringillidae, but the Estrildidae (waxbills and allies) and the Passeridae (Old World sparrows). It does not include the Emberizidae (New World sparrows and buntings). Each species has a fine painting of both sexes (when they differ), details of identification and plumage, a summary of distribution, and brief comments on habitat, migration, measurements, and references. The subtitle "An Identification Guide" seems odd to me, because of necessity the book cannot delve into state-of-the-art details of identification, but rather presents a overview of the family throughout the world. It is actually a "mini-handbook" rather than an i.d. guide. 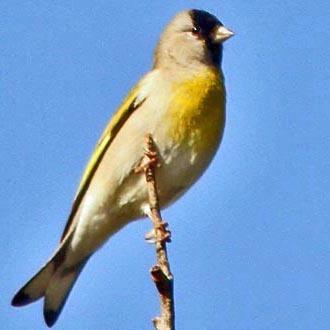 For example, what this book says about separating Cassin's Finch Haemorhous cassinii and Purple Finch H. purpureus is accurate enough as generalizations, but there is insufficient space to detail such things as variation in western Purple Finches which include streaked undertail coverts (usually considered a feature of Cassin's) or to emphasize bill shapes. The European birder visiting America will likely separate the species adequately, but a local birder searching for a vagrant is as apt to be misled by the text as not. For this reason -- and because of the Eurocentric choices for names (e.g., "Trumpeter Finch," unmodified, is a species, but then they use the modified term "Mongolian Trumpeter Finch" for another species) as well as some overly conservative taxonomy (e.g., failure to split the rosy-finches into four species; they lump the three American species with the Old World "Rosy-Finch") -- I downgrade this decent book from a "four star" to a "three star" entry. Benkman, C.W. 1993. Adaptation to single sources and the evolution of crossbill (Loxia) diversity. Ecolog. Monogr. 63: 305-325. Collar, N.J., and I. Newton . 2010. Family Fringillidae (Finches), pp. 440 –617 in Handbook of the Birds of the World (del Hoyo, J., A. Elliott & D.A. Christie, eds). Vol. 15. Lynx Edicions, Barcelona, Spain. Groth, J.G. 1988. Resolution of cryptic species in Appalachian Red Crossbills. Condor 90. 745-760. Groth, J.G. 1993. Evolutionary differentiation in morphology, vocalizations, and allozymes in nomadic sibling species in the North American Red Crossbill (Loxia curvirostra) complex. Univ. Cal. Publ. Zool. 127: 1-143. Lerner, H.R.L., M. Meyer, H.F. James, M. Hofreiter, and R.C. Fleischer. 2011. Multilocus resolution of phylogeny and timescale in the extant adaptive radiation of Hawaiian honeycreepers. Current Biol. 21: 1–7. Zuccon, D., Prys-Jones, R., P.C. Rasmussen, and P.G.P. Ericson. 2012. The phylogenetic relationships and generic limits of finches (Fringillidae). Mol. Phylog. Evol. 62: 581–596.